How do you choose your shooting socks? For some people, comfort is of prime importance when selecting their shooting socks. If you’re spending all day out on the shooting field or grouse moor you need to be sure that your shooting socks are warm and comfortable. However, for others, perhaps style and colour is of paramount importance. So, the big question then is, what do you co-ordinate shooting socks with? 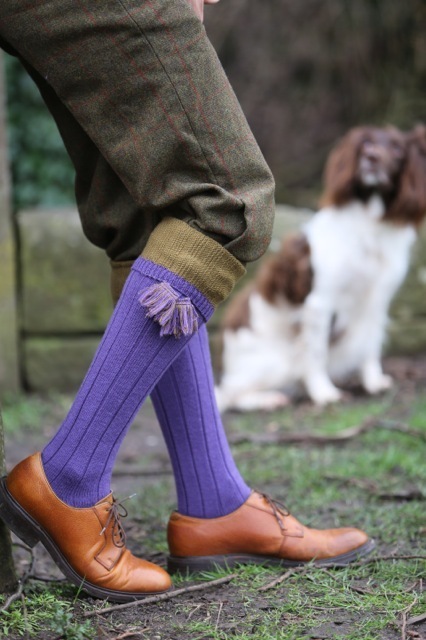 Should the colour of your socks match your shooting jacket or breeks? Or perhaps you should co-ordinate your shooting socks with your shooting tie? Shooting socks are now available in an array of colours. You can choose a simple plain pair of shooting socks, or shooting socks with a contrasting stripe, shooting socks with a pheasant emblem or, if you prefer, shooting socks with a vibrant pattern at the top. Once you’ve resolved the question of which shooting socks to choose, you then move on to garters or flashes for your shooting socks. To wear or not to wear? They certainly add a finishing touch to your shooting outfit. Some people prefer flashes which simply thread on to an elastic garter. Others choose the more traditional garter which is wrapped once around the shooting sock to hold it in place, then tied with a square knot. The two ends of the garter then dangle below the top of the shooting sock. Generally, the top of the shooting sock is worn so that it overlaps the bottom of the breeks. This again is a matter of choice as some like to wear their breeks over the top of their shooting socks. What a decision, but one that The Country Catalogue can help with. We stock a selection of both shooting socks and garters to help complete your shooting outfit. Don’t forget that not only do we sell men’s shooting socks but also ladies’ shooting socks and children’s shooting socks.